Sprinkles is handing out free cupcakes tonight between 8 p.m. and 9 p.m. to promote its newly expanded hours. One per customer. Anything in the case. No purchase necessary. The fabulous cupcake bakery at Preston Center, at the southeast corner of Preston Road and Northwest Highway. The store's new hours are 9 a.m. to 9 p.m. Monday through Saturday and 10 a.m. to 8 p.m. on Sundays. 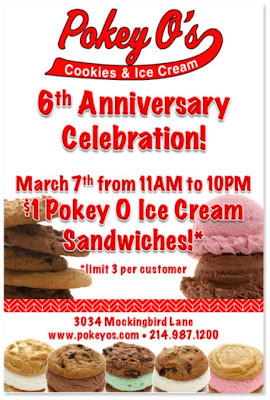 Pokey O's for $1 Today! Distillery, brewery and winery representatives will be on hand to sample a selection of Texas-made libations and to answer any questions you may have about them. Enjoy special sale prices on all the products. Whether you are a novice trying to broaden your knowledge or a seasoned connoisseur looking to refresh your palate, this spectacular Texas event should not be missed! I wanted Green House to wow me for lunch. It's sunny, it's 70, and the lines weren't that long. The Arts District Food Truck area has actually moved over in front of the Winspear, which is a much better location than the previous parking between the Belo Mansion and a parking lot/construction zone. The scene was pretty much perfect for wowing, but it just didn't quite do it. I open up their environmentally friendly clamshell (points for being green.) and the short rib sandwich was pretty. Big meaty pieces of short rib and I was excited for the first bite. So I took it. It was good. The short rib was tender and clearly cooked well. The horseradish cream could have used a little more horseradish. And the baby greens, well, they were just mixed greens. There's clearly some creative license in the menu creation for most places, so nobody is getting beaten up on that one. The sandwich was good. It really was. But for freaking $9.50 just for a sandwich, I think I should be allowed to expect better than just good. And yes, I'm whining about the prices. Not because I mind paying for good food, but because their prices are higher than other food trucks. $14 for lunch at a food truck just seems a little high. But I make these sacrifices so you get to know what's going on out there. You're welcome. Definitely not disappointed to have spent the calories on that sandwich, but a little disappointed that I paid almost $10 for it. Would I give Green House another short, probably. But that's because I'm still enjoying the sugar high from Limonata Pellegrino I got there. Just got an update from Normas: "We apologize for any confusion, but during the Texas Independence Day celebration, only the pecan pie slices will be 99 cents. All other Texas Menu items, including Frito pie, will be regular price." We've got your Friday lunch plans set up for you since your good old friend Texas is turning 176. Naturally, you’re going to want to celebrate over lunch. Head over to Norma’s. They’re serving up some birthday Texas Frito pie for 99 cents each. Madonna is having a huge party at American Airlines Center on Sunday, October 21st and everyone's invited to Madonna's 2012 World Tour. US residents ordering tickets online to a US performance will receive their choice of a digital or physical copy of Madonna's new MDNA album with every ticket purchased.